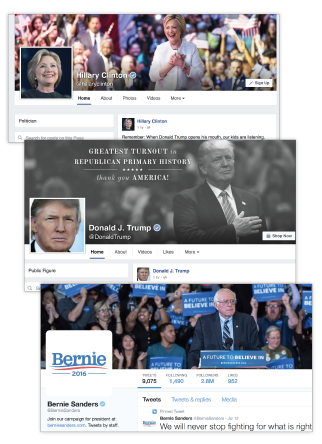 Sixteen years after Pew Research Center’s first study of digital communication in a presidential campaign, social media is central to candidates’ outreach to the public, changing the role and nature of the campaign website. While the candidate website still serves as a hub for information and organization, it has become leaner and less interactive compared with four years ago. Campaigns are active on social media though even here the message remains a very controlled one, leaving fewer ways overall for most voters to engage and take part. Clinton’s campaign has almost entirely bypassed the news media while Trump draws heavily on news articles. Clinton’s website offers two main sections for campaign news updates, both of which mimic the look and feel of a digital news publisher, but oriented around original content produced in-house. Trump, on the other hand, mostly posts stories from outside news media on his website. This pattern is also evident on social media, where 78% of Trump’s links in Facebook posts send readers to news media stories while 80% of Clinton’s direct followers to campaign pages. On Twitter, a similar tendency emerges in what each links to. Sanders, for the most part, falls in between the two. On websites, citizen content is minimized or excluded altogether; in social media, Trump stands out for highlighting posts by members of the public. 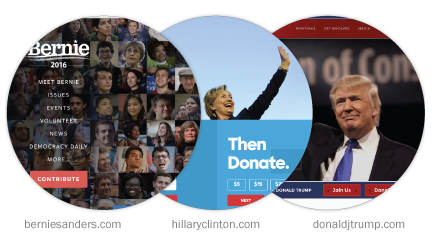 Unlike previous cycles, none of the sites offers the user the option to create a personal fundraising page, nor do their news verticals have comment sections. And only Sanders affords supporters the ability to make calls on his behalf, offering customized scripts; the other candidates limit outreach to donation requests and email and volunteer sign-ups. Moreover, it was rare for any of the three to repost material on social media from outsiders (there were almost no re-shares on Facebook and only about two-in-ten tweets from any of the candidates were retweets). Only Trump tended to include members of the public in his reposts: 78% of his retweets were from members of the public, compared with none of Clinton’s and 2% of Sanders’. Trump’s focus on the public also stands apart from 2012, when only 3% of Obama’s tweets during the period studied and none of Romney’s retweeted members of the general public. Facebook and Twitter usher in a new age in audiovisual capabilities. Candidates were already experimenting with regularly posting videos in 2008 and 2012 as YouTube increased in popularity, though to a minimal degree. By contrast, Clinton posted about five videos a day on Facebook and Twitter during the time period studied and embedded video in about a quarter of both her total tweets and Facebook posts. Trump, who averaged about one video a day on social media, was least likely to include regularly updated videos on either social platform (only 2% of his tweets, for example).